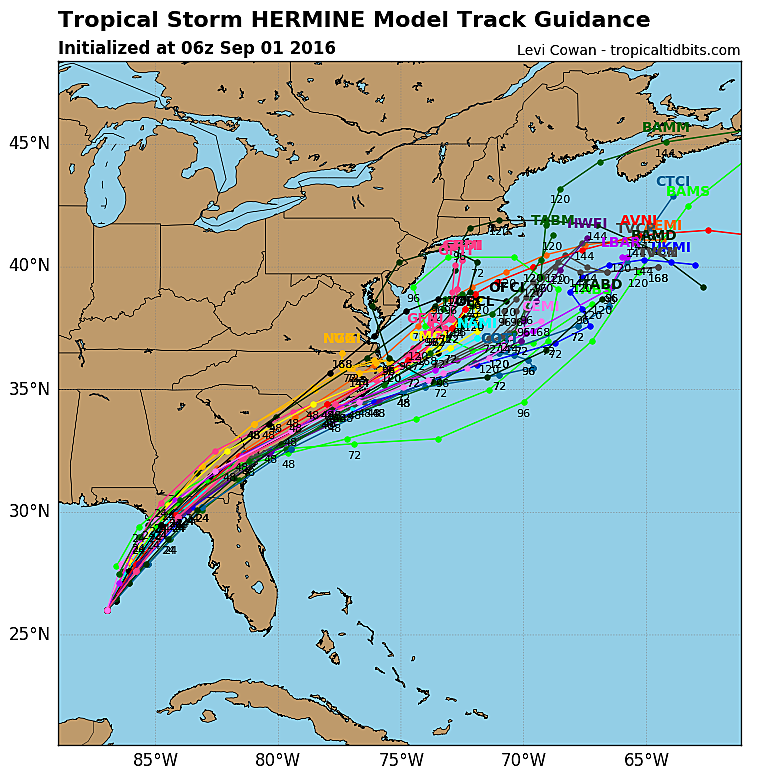 The forecast for Tropical Storm Hermine remains in flux, as the latest data shows a shift back to the east along with a later impact on the Garden State. As I stressed Wednesday afternoon, Tropical Storm Hermine's eventual impact on New Jersey over the Labor Day Weekend is still far from certain. Thursday morning's forecast models show two new developments: a slight shift in the track toward the out-to-sea direction, and a distinct slowdown in forward movement. Don't get me wrong - New Jersey's Labor Day Weekend is still in jeopardy, but this forecast is a bit friendlier than the one from Wednesday afternoon. Tropical Storm Hermine forecast update from the National Hurricane Center, as of 5 a.m. Thursday. Three notable things stick out to me on this graphic. First, the NHC suggests Hermine might become a hurricane just before landfall. This strikes me as a bit odd - while some forecast models (namely the NAM and UKMET) do suggest this intensification, it's not really a consensus solution. Second, the double dot placement just southeast of New Jersey for Monday and Tuesday morning. That IS borne out in the models. Such a stall just off the Jersey coast would not be good, potentially keeping the threat for wind and rain and rough surf through late Monday or even Tuesday. And third, the storm is expected to become post-tropical on Sunday. While that means the storm will lose some of its "tropical" characteristics, the distinction doesn't mean much in terms of the potential weather impacts here in the Garden State. --A Friendlier Forecast: Such a shift eastward by just a few miles lessens the impacts on New Jersey quite a bit. Being clipped by only the left (west) side of the storm is good, as the right-front (northeast) quadrant of tropical system generally contains the strongest winds and heaviest rain. --Timing: Given the latest guidance, we might salvage clear weather for Saturday. I'd place the highest chance for rain and wind from Saturday evening through Monday morning. The latest forecast from the National Hurricane Center pushes the timing even later. --Worst Case Scenario: Storm tracks west again and skirts right along the coast. Tropical deluges of rain could cause inland flooding and 40+ mph winds could cause power outages. --Most Likely Scenario: Given the current forecast, we'd simply see a (very) wet and windy period of weather. The heaviest rain and strongest winds would occur in South Jersey and along the Jersey Shore. Meanwhile, NW New Jersey could end up with just a few showers, some clouds, or even nothing at all from Hermine. --Best Case Scenario: Could the storm continue trending to the east and out-to-sea as it slides up the coast? Absolutely. The further east it goes, the lower our chances of heavy rain and gusty winds. --Confidence: Check out the "spaghetti plot" of forecast model plots to the right. 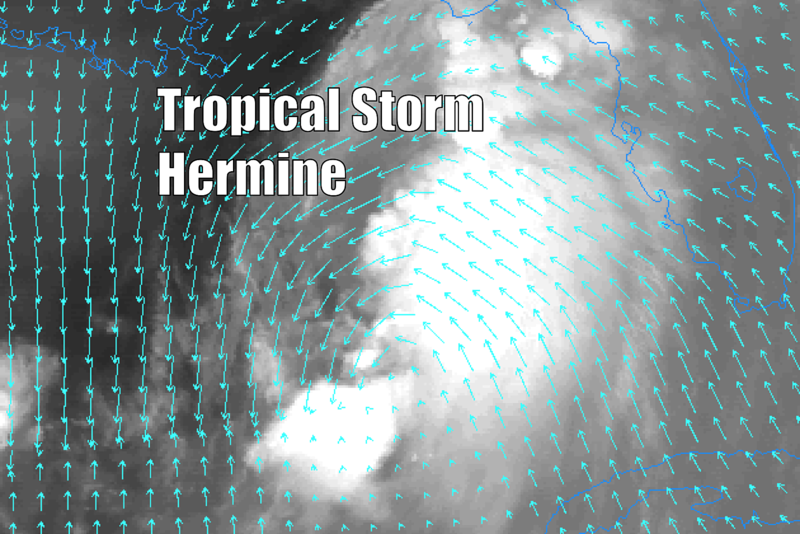 There's still a wide spread of solutions for Hermine's path as it tracks up the East Coast. A few possible tracks go right over New Jersey. But some tracks put the storm way out to sea. There is still a lot of time for this forecast to evolve, and until then our confidence remains shaky. We'll know more after the storm makes landfall along the Florida panhandle Thursday night. And we'll be even more confident when Hermine moves over coastal South Carolina on Friday night. --At the Shore: Once again, it's important to note that no matter where the storm goes, rough surf and dangerous rip currents are going to be a problem. Even if we manage a period of sunny weather over the Labor Day weekend, I highly doubt you'll want to go swimming in the ocean. If Hermine produces a significant on-shore flow (easterly winds), storm surge and coastal flooding could be an issue too. (On the order of 1 to 3 feet.) I'm particularly concerned about the notion of the storm stalling just southeast of NJ. The constant easterly wind would push a lot of water toward the Jersey Shore. --Bottom Line: It's not Armageddon. It's not the Storm of the Century. But we all need to take Hermine seriously, and continue monitoring the forecast closely. Our weather team and news staff will have updates on-air throughout the day, and we'll update the web regularly with the latest information and insights.